Another old and simple project I did for my son's room. Bought wooden letters from craft shop. They were like 2 to 4 ringgit each. Lined them up on newspaper. Spray-painted them. Stick them on the wall. Done! 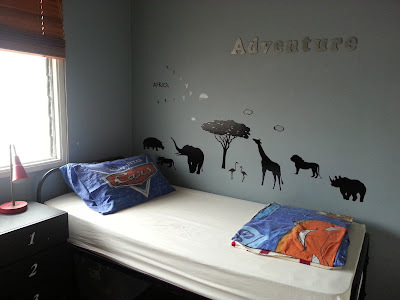 I added the wall stickers as well (need to be changed soon as the boy has grown up). The bedside table was left by the previous house owner. It was originally boring brown. The wood is solid, heavy and good. I gave it a matte black paint and stenciled the numbers. The bed came from the lady who gave us the cupboard and other stuff. It is metal with wheels, like hospital beds. We have two, one in my daughter's room which I painted white. I'm planning to sew bedding for him. The fabrics are patiently waiting in the sewing room. Ralph Lauren's bedding will be the inspiration.